Got this pic today Nov. 26th from Stina. I am so lucky to have my cats at Stina and Sebbe’s, they are the best! 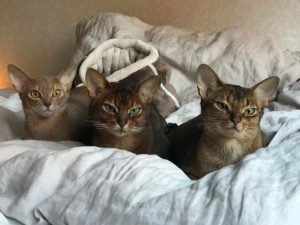 ❤️❤️ IC Abystyle’s Ma Demoiselle ABY p, GIC S*GoodNews Prince Jeorge ABY n and IC S*GoodNews Nala ABY n.